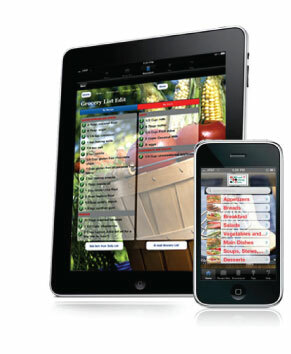 Named by Bon Appetit as one of 8 Best Healthy Cooking Apps – Best App for Food Allergies. 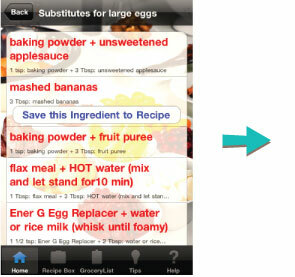 With a simple tap, trade out your Allergen(s) in any of the recipes with safe substitutions. Now no recipe is off limits! Find substitutions within the recipes for: eggs, butter, milk, yogurt, buttermilk, cream, sour cream, cream cheese, cheeses, nuts, nut butters, corn syrup, and soy. 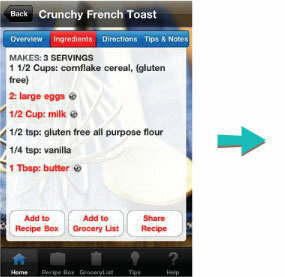 Customize your recipes and then share them through Email, Facebook, and Twitter. Find great tips for allergy free cooking that will help to give you delicious results. Save your recipes to your Grocery List and have all of the ingredients you need, including your substitutions for your allergens, at your fingertips. Your list will be organized by Aisle or by Recipe. Add items from your daily list as well. Your custom-tailored recipes can also all be saved in one place: Your Recipe Box. For common allergens like eggs, butter, milk, yogurt, buttermilk, cream, sour cream, cream cheese, cheeses, nuts, nut butters, corn syrup, and soy. This is the essential tool for anyone dealing with food allergies. If you are allergic to Gluten, Dairy, Eggs, or Nuts, you no longer have to search for a recipe that does not contain your allergens. 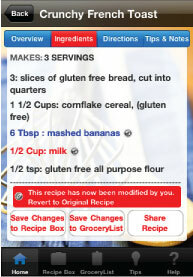 Cook IT Allergy Free will take any of these great gluten free recipes and make them safe for you. 200+ Recipes, with MORE recipes being added all of the time. Beautiful images of all recipes. Any ingredients that appear in red within a recipe can be traded out with a correctly-calculated allergen safe substitution option that will work with the recipe. Also find the best tips and tricks for gluten free and allergy free cooking that will help to give you delicious results in the recipes. Saving your recipes to your Grocery List will allow you to have all of the ingredients you need, including your substitutions for your allergens, at your fingertips for easy shopping. Check off items as you shop – clear single ingredients, entire recipes, or your entire list with simple taps. Email Grocery list to yourself (or whoever is doing the shopping) or use the list directly from the phone. Save your customized recipes to your category-organized Recipe Box. Have offline access to them anytime. Keep your own notes within each recipe to remind yourself of what you liked or didn’t like about your results. Allergy Free cooking is all about “trial-and-error”.